It is the time of year when it seems that everyone has a cold. There are some important steps that your senior can take to stop from getting a cold this year. Here’s how Oshkosh live-in care professionals can help seniors stave off the bug this winter. The most important thing that a senior can do is to wash his or her hands regularly. About 80 percent of cold germs are picked up from the things that are touched. Therefore, make sure that everyone is washing his or her hands for at least 30 seconds on a regular basis, especially after coming in contact with random surfaces. If you cannot get to water, then use a hand sanitizer that is over 50 percent alcohol. Most seniors were taught to cover their mouths with their hands when they coughed. This was bad advice because it moves the germs from the mouth onto the hands. Instead, convince the senior to cover his or her mouth with an elbow when he or she coughs. Sanitizing on a regular basis can help stop cold germs from spreading through the house. While disposable wipes can be very helpful, they are also very expensive. Bleach and water makes a wonderful and more economical cleaner. Using paper plates, plastic utensils and disposable cups can help cut down on the spread of the cold virus. Therefore, consider using them for just a few days if someone has a cold. They can especially be useful if the person who normally does the dishes does not feel good. Getting enough rest and eating a well-balanced diet can help the cold systems stay away. Try to make sure your loved one eats enough vitamin C each day as the body cannot store it and the body’s immune system needs it to fight the cold germs effectively. Try to get at least eight hours of restful sleep each night. Encouraging your senior to follow these five simple steps can help stop them from getting a cold this year. 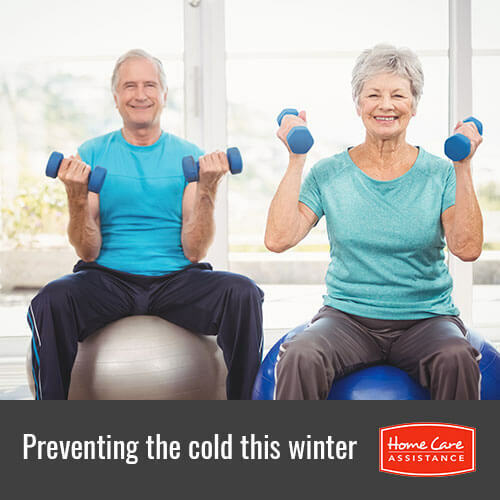 You can also help prevent the cold by calling Home Care Assistance at (920) 710-2273 today. We provide flexible live-in and hourly home care Oshkosh seniors need to maintain physical and emotional wellbeing. Talk to a friendly Care Manager today to have a care plan customized for your loved one.